A selection of the music from the Bülow Collection - the legacy of 18th century Dainish nobleman Johan von Bülow performed here by Helen Davies and Poul Høxbro. 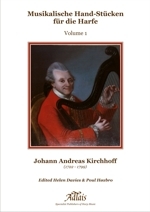 The recording includes a mumber of Johann Andreas Kirchhoff's "Handstück für die Harfe" which have been complied and edited by Helen Davies & Poul Høxbro and published by Adlais Music Publishers as Musikalische Hand-Stücken für die Harfe Volume 1. (from Sonata for flute and continuo - Anon). Johan von Bülow was born on 29th July 1751 in Nyborg, on the island of Funen, Denmark. His father was a military officer, but both parents died before Bülow was two years old. He was fostered by an uncle, and began his military education at a very young age. He had already achieved the rank of 2nd Lieutenant by the age of 16 in the Royal Life Guards, and he was promoted to First Lieutenant in 1772 at the age ot 21. Both his foster parents died when Bülow was still very young, but they left him an annuity which enabled him to pursue a parallel education by enrolling an Sorø Academy, where he studied law, philosophy, mathematics, physics, French and music. All this stood him in good stead when he was appointed a nobleman to the court in 1773, a year that was to be a turning point in his life. He was later elevated to the post of Lord Chamberlain to the young Crown Prince Frederik (later Frederik VI). Bülow was in fact mentor to the Crown Prince and it was a job he undertook with great responsibility. He was able to navigate his way around the court of the mentally weak monarch, Christian VII, with great skill and shrewdness - - necessary attributes as it was a court filled with power play and intrigue. In 1785 Bülow married the entremely wealthy Else Marie Hoppe, and it was her wealth that enabled him to buy Sanderumgaard on Funen in 1792. Eventually, Bülow's star began to wane. There were more and more disagreements between him and the Crown Prince and at the same time there ware many at court who plotted against Bülow. Bülow fell into disgrace and was dismissed in 1793. He was later given redress, but never returned to life at court. He moved to Sunderumgaard the day after his dismissal and here, as he himself said, he ‘lived the happiest times of his life until his death in 1828. Bülow was an extruoroinarily well educated and knowledgeable man. He was a scholarly patron of the arts and natural sciences, and willed his large collection of manuscripts and books to Sorø Academy. Like many other 18th century nobleman Johan von Bülow was a competent amateur musician. He played at least four different instruments and as he said himself, "composed a few pieces". But it is his well preserved manuscript collection of music that makes him special in a historical perspective. There urn almost 300 works in his collection housed at Bibliotheca Academiae Soranae and more than 600 dance tunes in his “Dancing Books’ in the Royal Library in Copenhagen. These collections give a very special representation of the sounds heard in salons in Denmark at the end of the 1 8th century. The collections contain chamber music, solo repertoire, arias and the popular "English" dances, which were played and danced as almost every festive occasion. There are many anonymous pearls, but well known composers (the sons of J.S.Bach, Gluck and Haydn) are also here, as well as many now almost forgotten musical personalities - - Høeg, Guiseppe Sarti, and not least, harp virtuoso Johann Andreas Kirchhoff. Tracks 1/4/13/15 are tunes found in the dance books in the Johann von Bülow Collection held in the Royal Library Copenhagen. All others tracks are from manuscripts held in the Jonann von Bülow Collection at Biblinteca Academiae Soranæ. With thanks for financial support from the Beckectt Foundation, Gramex and Erik and Susanne Vind (Sanderumgaard). Special thanks to Bibliotheca Academiae Soranæ.